With CRM 2011 on the verge of being released there are new features being introduced that will allow you to show 1:N related records in a Sub Grid but there is still a limitation of showing information that is from a N:1 (lookup) relationship. 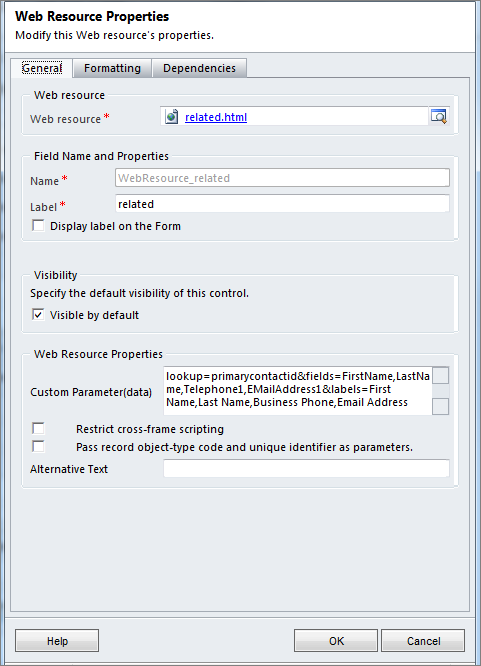 Using some other new features of CRM 2011 I’ve created a Web Resource that will allow you to show related information from a lookup field. This Web Resource is a custom html page that pulls information from a specified lookup and queries CRM, using the new REST endpoint, for the related data and displays it in a simple format. Here is what it looks like loaded into the form. This example shows information being pulled for the Primary Contact on the Account form. The Web Resource pulls the GUID and Record Type from the Primary Contact Field and using the Field parameters specified on the Web Resource, queries for the contact information and displays it inline. 3. Open the Solution to verify you have 3 new Web Resources. 5. Either highlight an existing section or create a new section to add your Web Resource to. 6. Once a section is highlighted, click the “Insert” tab at the top and then click the “Web Resource” button on the ribbon. 7. In the Web Resource field, select the related.html WR that was added. 8. Enter a name into the “Name” and “Label” field. 9. Enter the parameter string in the “Custom Parameter(data)” field. labels – The labels you want to display for each field. Has to be in the same order as the field list. This customization is provided as-is with no warranty. var soapmessage = "<?xml version=’1.0′ encoding=’utf-8′?>"
soapmessage += "<soap:Envelope xmlns:xsi=’http://www.w3.org/2001/XMLSchema-instance’ xmlns:xsd=’http://www.w3.org/2001/XMLSchema’ xmlns:soap=’http://schemas.xmlsoap.org/soap/envelope/’>"
soapmessage += "<soap:Body>" + sCommand + "</soap:Body></soap:Envelope>"
var query = "<RetrieveEntityMetadata xmlns=’http://schemas.microsoft.com/crm/2006/WebServices’>"
query += "<entityName>" + entity + "</entityName><flags>EntityOnly</flags></RetrieveEntityMetadata>"
This is a plugin that I developed to audit transactions in CRM 4.0. The records that are created are stored in CRM and can be related to the entities in CRM. Take advantage of CRM features since the Audit records are CRM entities. Retrieve (Read) – Use caution when using this one. A read transaction occurs after other messages. This customization may not be supported by Microsoft and is provided as-is with no warranty. In this post, I’m going to show you how to modify the entity drop down for the Customer Lookup without changing the security for the whole application. I’m going to use the customer lookup for opportunity as our example. By default you have Account and Contact in the drop down for the ‘Look For:’ search criteria. If you look at the html for the customer lookup field, on the opportunity form, it looks like this. The 3 attributes we will need to change is lookuptypes,lookuptypeNames and lookuptypeIcons. To reorder the drop down, add the following code to the ‘OnLoad’ of the Opportunity form. The dropdown should default to Contact when it’s opened. To remove Contact from the customer lookup for Opportunity add the following code on the ‘OnLoad’ of opportunity. The lookup should only be for accounts. Although it may be possible, I wouldn’t add entities to the lookups since the customer relationship does not exist. I’m always getting the question on how to view a logo or image in Microsoft CRM. Well here is a quick customization you can add to your account form and view a logo. Once you add this script on the ‘OnLoad‘ event of the form, all you need to do is add an image called ‘logo.jpg’ as an attachment and everything will show up properly. This customization will even work offline. //Iterate through all the attachments. td.innerHTML = "<img src=’" + attachments[i].url.concat("?AttachmentType=", attachments[i].attachmentType, "&AttachmentId=", attachments[i].attachmentId) + "’/>"
When your done, your form should look like this. If you really want to get creative you can go a little further and build a viewer to page through all images that are attached to the record. A friend of mine called me up and asked if it was possible to create records in one CRM system when they are created in another one. Well here is a quick example of how to do it. Both CRM Systems have the exact same fields for the records you will copying. All records in the two CRM systems have the same guids for matching records. If there are discrepencies with the guids in each system, there will be issues with this example. When the postImageEntityXml is Deserialized into a DynamicEntity, it has the guid of the source system. When it’s created in the target system, it’s created with the same guid. For this example I will show you a simple Post Callout to replicate a Create action, but I recommend sending these transactions to a Message Queue and then processing them from there. It’s also not only limited to Create, the same thing can be done for other actions. //Create the Service and connect to remote server. //build the credentials for access if the current user doesn’t have access. 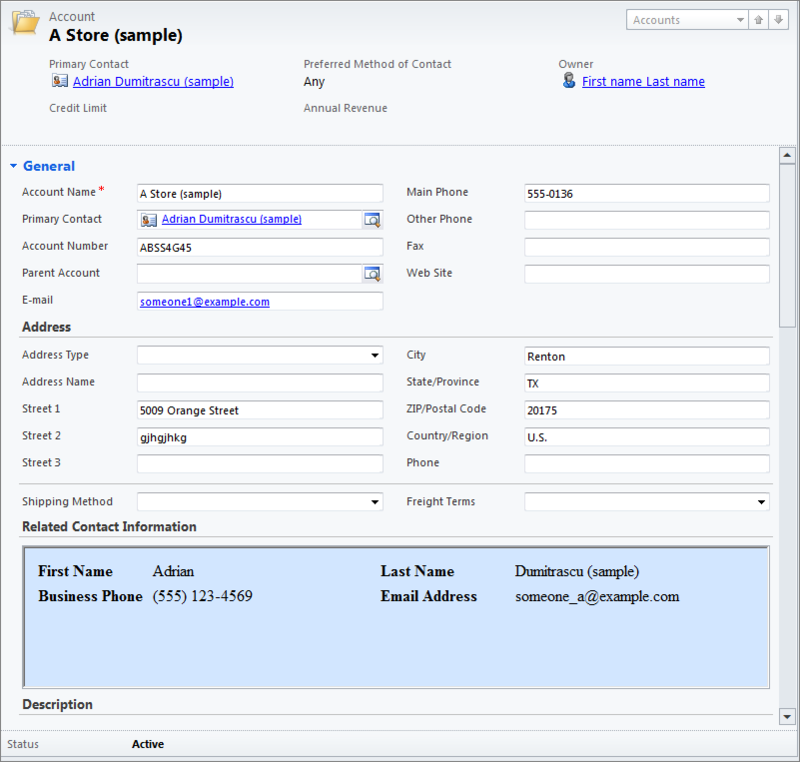 This code isn’t entity specific so it will work for most of the entities in CRM. All the entity information is in the postImageEntityXml and is Deserialized into the DynamicEntity. There are a lot more things you can do to improve this process. This is just a simple example. Some other things to consider adding into your solution is Message Queueing and Exception Handling. A big shout out to Henry who is out in Ohio this week :). If you want to try to cut down on clicks on CRM forms, one thing you can do is create a ISV button for actions they perform a lot. For example if users create appointments from the contact form, they would have to either go to Actions > Add Activity >Appointment in the top menu or click on Activities > New Activity > Appointment from the menu on the left. Add a ISV button in the isv.config.xml file. The text in Red is the same function called when you click new appointment from the menu. Save the changes and refresh your contact form.